I know that there are a few reviews on this already in the beauty blogging community but after using it for the first time, i thought i would give my say on this product! I bought this product just after christmas whilst the 'sales' were on in lush but after hearing such good things about it i had been eyeing it up for a while. I thought as it was 'spend £20 get free goodies' i went ahead and picked it up. Lush doesnt give much away about this product and i was intrigued to use it, but before i did had to check with a few girlies on twitter whether or not to use conditioner afterwards! 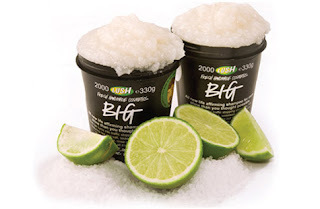 I must admit i was a little skeptical about using a product on my hair that is made fom 50% sea salt! The reviews id read wernt that this product made your hair 'big' but how shiny it was! I applied quite a lot as i have quite long, really thick hair and rubbed it all over my head, at first it didnt really seem like it was doing much so i added a little more and then it really lathered up. After a few minutes i rinsed out and conditioned my hair using my normal conditioner, which is the loreal elvive one in the pink bottle. I didnt use any styling products afterwards and apart from my fringe i left my hair to dry naturally. Normally when its left to dry naturally my hair will go really wavy, but it didnt it dried quite straight and SUPER shiny! I was so impressed, it felt so silky and shiny! I would highly recommend this product, i know that some people may find it pricey but its quite a big pot you get and you dont need to use a big amount each time. I would also use this quite sparingly, maybe once or twice a week as i have read that it can be quite stripping on hair colour. Overall i am extremely happy, glad i took the plunge in purchasing and if you want super shiny hair then this product is for you! Would recommend to anyone! I really want to try this but am only using semi permanent hair colour so don't know if I can..
Nice! I've been meaning to try it out lately anyway. I'm also hosting a blogsale right now, so if you're interested, please take a look! I may have to try this out- I keep meaning to venture more into other things in Lush, as i've stritcly stuck to bath bomb/melts.